This is a very interesting week for comics! Marvel kicks off two new titles — Exiles and Domino — and follows those up with possibly the best issue of Unbeatable Squirrel Girl to date. At least one of those new comics might become a regular purchase for me, and Squirrel Girl will hopefully be around until the end of time. Comic Book of the Week easily goes to Unbeatable Squirrel Girl for a single issue story of friendship, heroics, weird time malfunctions and more heart than ten comics! In other news, I’m really enjoyable Gwenpool so far. I’ve got to order the last couple of trade paperbacks to finish it off. Gwenpool, the comic, is definitely far more than it would seem on the surface. So much for my discovering that Ulysses is The General a couple weeks ago. He straight up reveals himself as such in this issue! It was inevitable! 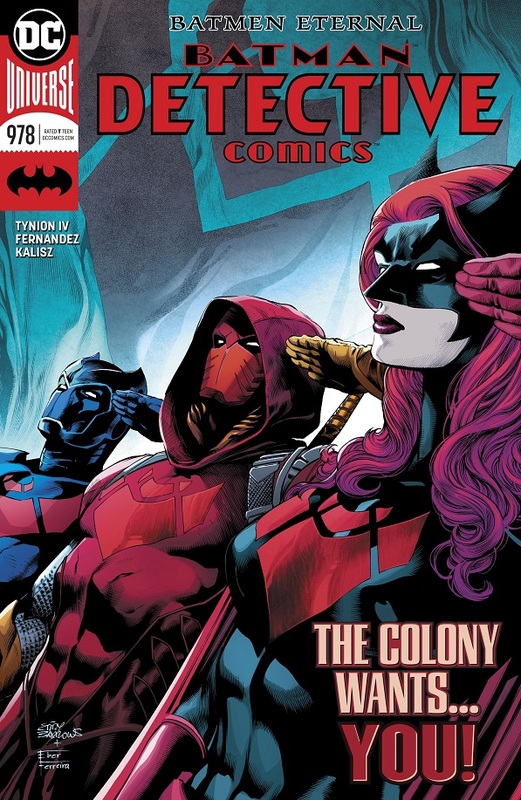 Batman and Red Robin have taken the two mind-controlled Colony agents to the Batcave to investigate why they went crazy and slaughtered some mobsters. Batman goes to track down Batwoman and her father at Kane Manor, while Red Robin stays behind to run some medical exams on the agents. Ulysses then reveals himself as The General and launches his attack! He takes over the Colony ship over Kane Manor to begin attacking our heroes, then turns the two captive agents in the Batcave into O.M.A.C. soldiers! And Red Robin is a secret O.M.A.C., too! This is definitely some fun and exciting Batman and Robin action! The Dynamic Duo splits up as part of their investigation, but they’re still a ton of fun to read! This is a solid issue of ratcheting up the tension and using the characters’ personal relationships to do so — though it will never not feel weird that Jacob Kane is Bruce Wayne’s blood uncle. For a character based on losing all of his family at a young age, necessitating being raised by his butler, it’s weird that Bruce had an uncle this whole time. Has DC ever sorted that out? Why Bruce wouldn’t go live with his mother’s brother? Whatever the case may be, this was definitely a fun issue, keeping the momentum and escalation burning. I’m excited to see the big showdown coming up. And I liked the quieter moments, too. Red Robin has a brief scene with Orphan and is about to suggest taking over from Clayface to continue Cassandra’s Shakespeare lessons. It was cute, and I hope Tynion follows through on that bit. Cassandra Cain needs friends and people to care about her and help her grow. Tim is perfect for that! TL;DR: Tensions mount and characters get a few nice moments together before we kick off the next big battle! 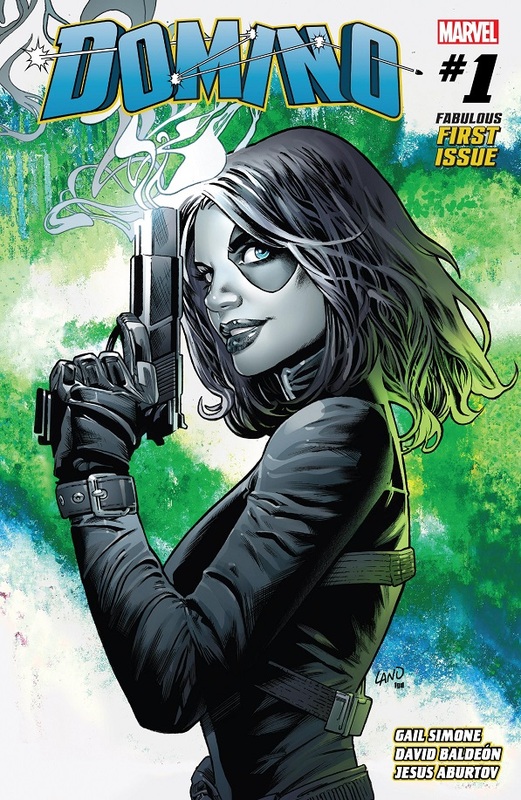 It seems like Domino might be the spiritual successor of solo female titles like Hawkeye and Spider-Woman. Considering I loved both, and thoroughly enjoy the works of Gail Simone, you best believe I’m on board! Domino is running mercenary jobs with her friends Outlaw and Diamondback. They go to stop some logging thieves one rainy night, but that turns into an ambush! Our heroes fight off some Russian thugs and the bat-mutant Greywing and find out that someone named Topaz has put a price on their heads for some reason. Later, the girls throw Domino a surprise birthday party, inviting a bunch of her mercenary and X-Men pals (and Greywing). It’s a great time (The girls got her a dog! And Dazzler is the musical guest! ), but Domino suffers from headaches and painful flashbacks and she goes to lie down. Domino is ambushed in her bedroom by Topaz, who somehow disables Domino’s luck powers and throws her out a window! This first issue is a little messy, but otherwise a fun re-introduction to Domino and her world. The issue is stuffed to the gills with activity and characters, a testament to Simone’s skill in filling comics. Baldeon’s art is good and fits, but it does feel a little sloppy, as if rushing to make sure he could fit everything. Those aren’t really knocks against the issue. From the fight at the logging sight to Domino’s cameo-filled birthday party, it’s a fun comic that rests easily and comfortably on the characters. You get a real sense of Domino as a person (though I can’t tell you if this Domino matches up with classic Domino). She seems fun, and her friends are fun, and they have fun. Simple as that. I feel like the issue could have done more to establish Domino’s world and how it’s different from other superhero comics. She’s a mercenary and that’s an interesting world. But between her mission, then ambush and then a birthday party, she might as well just be any other superhero. There’s not much in this issue that cements Domino’s story as unique or worth telling in and of itself. It’s just an issue where a fun character gets a fun new comic book series and hopefully we all have fun. That’s good enough to kick things off, but I’m hoping Simone can find something to make this series stand out. Also, Domino explains and re-explains her luck powers half a dozen times in this one issue. That was weird. TL;DR: The new Domino comic kicks off in a pretty fun and entertaining way, with an issue stuffed with action, characters and enough humor to make it all worthwhile — for now. 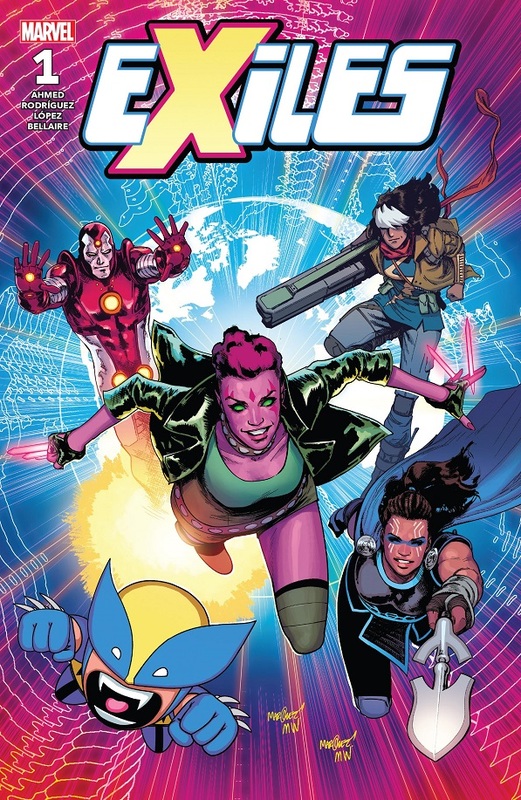 I was a huge fan of the original Exiles, so I am definitely on board for this latest revival. Can it capture the magic of the original? Not in this first issue, it doesn’t! Nick Fury is now the Unseen, a pseudo-Watcher chained to the Moon to observe everything — and he sees that the Multiverse is being eaten by some Time-Eater. An alternate, still-human Nick Fury shows up on the Moon with the Tallus, the Exiles’ main artifact, and the Tallus summons Blink from Earth to save the Multiverse. The Tallus is operating on its own at the moment. First, it takes Blink to a war-torn world and forcibly recruits Khan, an older, grizzled Kamala Khan. Then they go to a futuristic world to grab a new version of Iron Lad. But then the Time-Eater — a desiccated Galactus head — shows up. I don’t know how unfair it is to compare this new Exiles against the old, but I’m going to do it anyway. The original Exiles came out of nowhere and ran for over 100 issues of almost perfect comics. That’s saying a lot! Not even the new Ms. Marvel comic, arguably Marvel’s most popular new comic of the past decade, has come close to 100 issues yet. So clearly the original Exiles did something right. And then every subsequent attempt to revive the series/premise failed spectacularly. So that begs the question of why this new iteration exists and whether or not it can succeed. Based solely on this first issue…I dunno…maybe? The original Exiles succeeded because it was, first and foremost, one of the best damn character dramas on the stand. Yes, it was an insane comic about brand new characters jumping to weird alternate dimensions, but the comic was about the people, their relationships to one another and the happiness and tragedy they suffered as Exiles. No matter what crazy world they went to or what insane mission they had to accomplish, the comic was about the people. The first issue of the original Exiles comic introduced those people immediately. All six members were gathered in one place right off the bat, with nary a glimpse of their alternate universes. And by the end of the issue, all six were already working together, developing relationships and getting stuff done. No matter what classic comic references were thrown at them, they were always used to support the characters, never to overshadow them. We didn’t need to see their alternate universe because we could picture them through the strong character work. And this is where the first issue of the new Exiles fails hardest. This first issue is all about exposition; unnecessary, boring and uninspired exposition. First, the Unseen gets to drone on and on about who he is and what threat the team will face. Then we get a bit about Blink. Then we go and visit two different alternate realities that mean nothing to anybody so that we can meet alternate versions of classic characters, who get plenty of time to expose about what makes their realities and themselves alternate. And none of it matters. Not a single bit. Who cares about the origins of Khan’s world? She’s an older, grizzled Kamala Khan. Boom. I just took care of her exposition in a single sentence. The comic can accomplish that with a single picture of the character. Why not leave her origins to be explored throughout the series as the character develops? 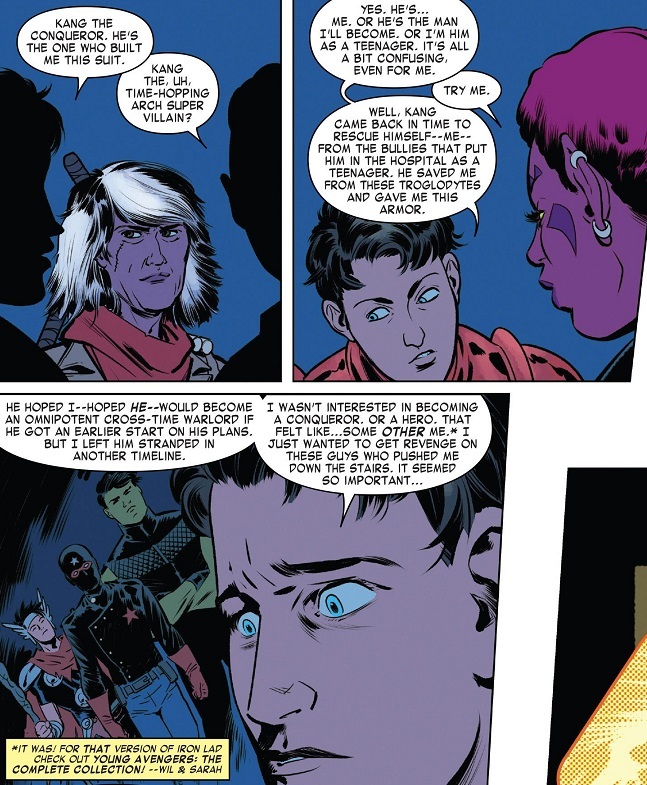 And do we really need multiple pages to explain why this Iron Lad is slightly different from the Iron Lad we already know, but it still, essentially, the same character? Iron Man as a teenager, with the surprise twist that he’s teen Kang, not teen Tony Stark. Boom. Another single freakin’ sentence! And here are so many sentences! And this is only a fraction of them! And then you’ve got the overwatch guy and the threat. In the original Exiles, the overwatch guy was a mystery. The reader didn’t know anything about him and the Exiles didn’t know anything about him. That made his mystery part of the ongoing story and he did not get in the way of the story kicking off. In this issue, the Unseen drones on and on insufferably, despite having nothing to do with actually forming the Exiles. Then you’ve got the threat: some force is eating the Multiverse. Yawn. Didn’t we just go through this with Secret Wars a couple years ago? Some vaguely evil force exists and needs superheroes to stop it. I don’t care that it somehow incorporates Galactus’ head. That’s not interesting in and of itself. In the original Exiles, the team had stakes. They were told that they were plucked out of their own universes because something had gone wrong, and if they could fix some other things that were going wrong, they could earn the right to go back home. That made the mission personal for every single member. They had a reason and a purpose to play along and see this through. In this new series, some vague, external threat exists and we’re just going to round up a bunch of random characters and force them to fight it. And we’re only going to get to half of them by the time the first issue is over (nary a glimpse of the remaining two team members). And they’re going to be so busy spouting exposition about themselves and their worlds that they’re not going to have any time to really interact or start building the necessary heart that a comic like this needs at its foundation. The issue is serviceable. The art is great and handles everything superbly well. And what little we do get of the various characters’ personalities are fine, though Blink is written more like a sassy modern teenager than classic Blink. The whole comic is readable. But man, oh man, this is a stumble out of the starting gate. The original Exiles got the first issue right nearly 20 years ago. Why bother trying again if you’re going to get it so wrong this time? TL;DR: The new Exiles kicks off with a whole heck of a lot of unnecessary exposition, overshadowing both the new characters and the tried and true premise. No, you’ve got something in your eye! Fair thee well, Erica Henderson. May life forever see you to green pastures and good tidings. 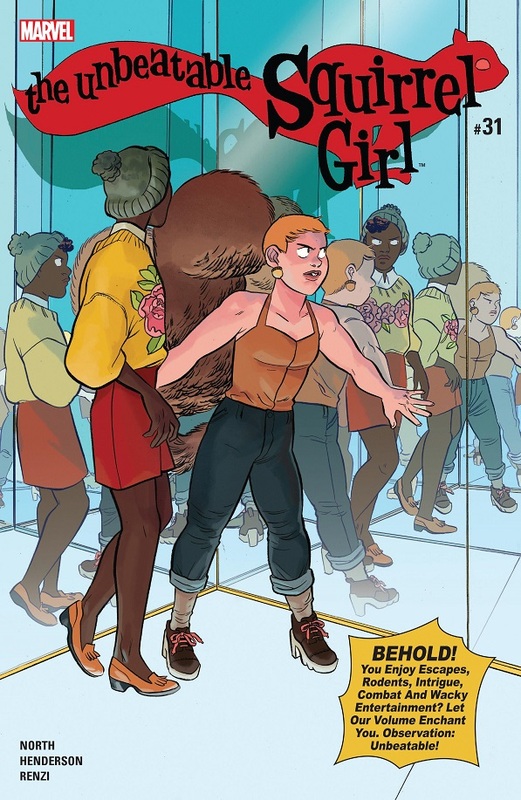 While battling the streaming super-villain EpicCrimez, Squirrel Girl and Nancy are zapped with an alien ray that shuffles them into Hypertime. They are moving so fast that it looks like everybody is standing still, but really, time is passing super, super slowly, and Doreen and Nancy can effect the slow world around them. Unfortunately, our heroes are still aging, and they realize they only have a few days of real world time before their Hypertime selves die of old age. So begins a lifetime of friendship, helping people and studying the intricacies of time travel in their mostly frozen world. Doreen and Nancy travel all around the city righting wrongs, stopping crimes and helping people, while also trying to build their own time machine. It takes the pair of them until they’re old and gray to figure it out, but they’ve managed to build a device to put them back into normal time in their de-aged bodies — but in doing so, they will lose the memories of all their decades together. Old Age Nancy and Doreen bid themselves a fond farewell and return to their regular time, regular bodies and regular memories, unaware of the lifetime they spent together. But Old Age Nancy and Doreen did leave behind a hidden letter about their lives together! So yeah, this is about as touching and as wonderful as comics get. I even knew the big emotional moment was coming and it still got to me. I let myself relax and just keep reading, to let the pages turn and let the moment hit me, and then it hit even harder because Ryan North used just the right line at just the right moment to really sell the farewell hug between Old Age Doreen and Nancy. That’s how amazing a writer North is. You build up to a moment like that. You use call backs and references and dialogue to help the emotions swirl around you and then you just deliver when the moment arrives. Gonna have to invent time travel from scratch! 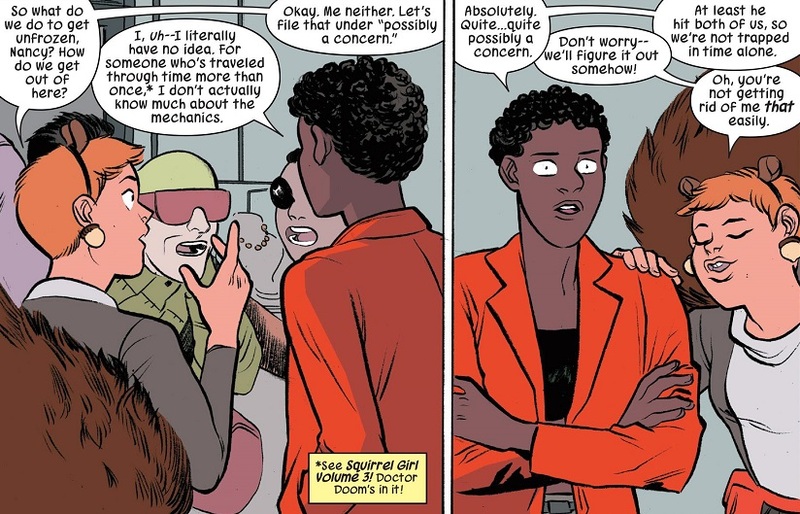 Unbeatable Squirrel Girl is not just a silly comedy comic. It has always mattered and it has always had heart, with the friendship of Doreen and Nancy right at the center. So when this issue kicked off out of the blue, I was already feeling giddy. Doreen and Nancy trapped in Hypertime? Sure! That sounds like a classic comic book conundrum, let’s see their take on it. Then North and Henderson make it absolutely, personally about the two of them and the sorts of helpful things they would do in this situation. Then the stakes keep getting raised and the years keep passing, and you know something is going to happen. Personally, I expected the oft-teased romance, but it never came — unless it’s in that secret letter at the end! Unbeatable Squirrel Girl is definitely building to something, it’s just taking the slow, subtle route. Erica Henderson has been an amazing artist on this series, and in the back of the issue, she tells the story of how her life was kind of in shambles when she randomly got drafted into the majors of comic book artistry. It’s a fun story and I couldn’t be happier with her work on Unbeatable Squirrel Girl. Her characters are catchy and personable, her action fun and her comedy on point. She will be greatly missed and I hope she finds good, solid work in her future. TL;DR: Unbeatable Squirrel Girl gets wonderfully personal and emotional in artist Erica Henderson’s final issue. I’m just going to come right out and admit it: I’m probably judging this book way too harshly. The X-Men, with the help of Trinary, defeat the Sentinel in India without much trouble. And they discover that some of the people in the crowd have Sentinel programming in their brains! The team absconds with the Sentinel to fly back to Wakanda and Trinary reveals that social media propaganda has been pushing a harsh anti-mutant agenda, leading to all these mobs. Like one in Louisiana, where a young mutant girl is shot by a mob. Gambit tries to save her, but he fails. When the team gets close to Wakanda, it’s revealed that Cassandra Nova has since snuck into the Xavier School and brainwashed Storm to fly to Wakanda and stop them. 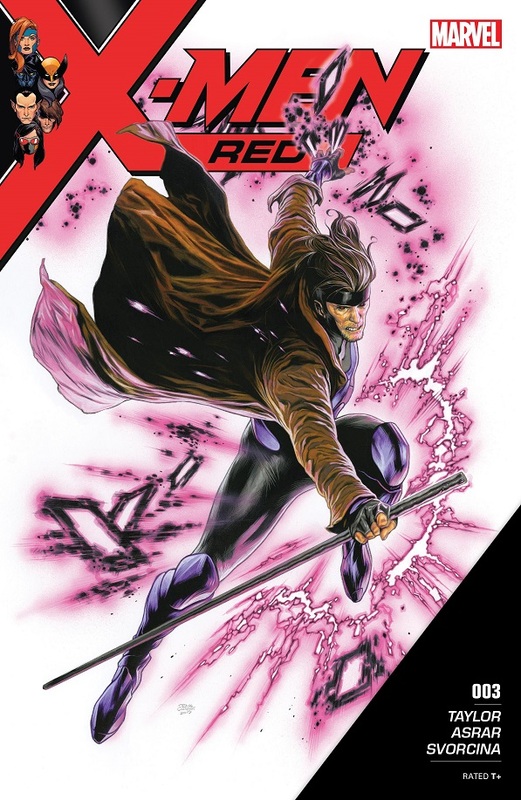 The reason I think I’m judging X-Men Red too harshly is because I have some pre-conceived expectations of this book. And I’m quickly beginning to learn that I was probably wrong. I expected the resurrection of Jean Grey to matter, to mean something, to have a purpose behind it. I expected the launch of a third ongoing X-Men comic to matter, to mean something, to have a purpose behind it. I thought X-Men Red would be special or have something new and/or interesting to say. But it doesn’t. Three issues in and none of this matters. It’s just another random roster of X-Men, a creator-favorite new mutant and a general, classic anti-mutant threat. It’s fine, don’t get me wrong there. It’s a nicely written and wonderfully drawn X-Men comic. But it’s just so painfully mediocre. And maybe I’m being unfair in judging this as mediocre, but again, great lengths appear to have been taken to bring this comic about. Why do none of those great lengths matter? I feel Nightcrawler and Honey Badger should be the best of pals! Jean Grey could be replaced by any X-character and the comic would still be the same. Any character in this comic could be replaced by any other X-character and it would still be the same. Even Cassandra Nova could be replaced by nearly any classic villain. Nightcrawler and Wolverine barely factor into the issue at all. The only characters that really do anything in this issue are Trinary and Honey Badger, Taylor’s two original characters. Which is fine, and Gabby is awesome, but so far Trinary is just your basic hero mutant with a pretty standard mutant power. The threat of social media propaganda fueling worse and worse anti-mutant hysteria is a solid X-Men threat. But it’s nothing special. It’s just something for the X-Men to face. And there’s nothing specifically Cassandra Nova about it to make her the necessary villain. Speaking of Nova, she gets a scene where she sneaks directly into the Xavier School. That’s pretty intense. It’s a school, right? And a home? You’ve got a major homicidal villain just waltzing into the home of the X-Men. She even murders a random student, just leaving his body on the floor. Then she mind controls Storm to stop this one X-Men squad. First of all, murdering that student is pretty grotesque. I don’t think any of us need such a callous example of Cassandra Nova’s evil, especially when I doubt that nameless student’s death is going to impact anything, as if the death of a student at the Xavier School is just shrugged off. And then Cassandra Nova has access to the entire school, but all she does is mind control Storm? Why not casually murder Storm? And then Kitty Pryde and then everybody else? It’s a nitpicky plot hole, but nitpicky plot holes are the kind of thing that turn me off a comic. TL;DR: Three issues in and X-Men Red seems content to just be another standard X-Men comic with standard characters and a standard plot. Posted on April 14, 2018, in Batman, Comics, DC, Marvel, Reviews, X-Men and tagged Blink, Detective Comics, Domino, Exiles, Nancy Whitehead, Red Robin, Squirrel Girl, Unbeatable Squirrel Girl, X-Men: Red. Bookmark the permalink. 8 Comments. Totally agree about X-Men Red. Very disappointing. But at least it’s better than Blue. I wanted to love #25. My favorite X-Men, Havok and Polaris, are finally in a story arc together as main characters. It’s a freaking dream come true. But Cullen Bunn is in one of his uncreative phases, and it shows all over. The plotting and dialogue seem childish. I’m really not happy. 2/10. I just looked at other reviews of that issue, and apparently my opinion is very minority. I’m kind of surprised that so many people liked it. Maybe my investment in those particular characters affected my judgment. But I thought the characters themselves were handled ok. I just didn’t care for how the story was handled, and I thought the dialogue was very lacking. I feel the same way about everybody else loving X-Men Red! However, I just read Domino, and…doggonit, why can’t mutant team books be this fun? And why can’t the great solo mutant books last more than 12 issues, aside from the Wolverine-related titles? And did I see a silent Guido cameo sneak in there, behind the drum set? I looked and I don’t think so! No Guido. That’s just a gorilla. I also would like to remind Marvel that their 6-issue MadroX limited series launched into a 50+ X-Factor run. Those are damn good characters that people love! Domino was a lot of fun. Inez and Diamondback are good supporting characters, and the dialogue’s clever. I went back and forth on the art. Sometimes I liked it, sometimes I didn’t. Exiles was really good. I’ve missed Blink, and she’s plenty of fun here. Khan is an interesting character, and I look forward to more of her. The art’s not my thing, but eh, whatever. Squirrel Girl was so good. Such a beautiful issue. Doreen and Nancy are the best of all BFFs. X-Men Red was good, but not great. It was a step down from the first two issues. Felt like it was just moving pieces around, with little real development. I’m still enjoying it, though. I think I felt the same way about the art in Domino. It was a style I liked, but it could be a bit weird in places. Definitely not an issue killer. I definitely liked Blink and potentially Khan in Exiles. The characters seem fine (though I think Iron Lad is a boring choice). I’m definitely willing to give it a further chance.